In November I will be presenting a series of free presentations in Kolkata to relaunch Indian mathematics. You see, what young mathematics students get taught today is fundamentally flawed! Only by recompiling modern mathematics via Indian Laws and Logic will we ever truly understand mathematics. Alas, the elementary school mathematics pedagogies taught today are derived from 16th Century English mathematics, which in turn was based on a bad translation of ancient Greek mathematics. Just two digits are required to power all modern computation, 0 and 1. Yet the Greeks did not consider 1 a number and their mathematics had no concept of 0 or negative numbers. Thus, began an evolution of mathematics education that required constant and unnecessary workarounds, corrections and rules. The sense of Brahmagupta's laws of mathematics was never seen as the English exported their mathematical non-sense throughout their colonies and settlements of the British Empire. Had Indian laws and logic, rather than Greek mathematics been the starting point as the West transitioned from Roman Numerals to the numbers we use today, who knows, we might have cured cancer and colonised Mars by now! So, read on to discover a little about me and my quest to change mathematics and unlock its pure power and beauty; starting in India, for free, this November! Fifty years ago, in 1968, I noticed the way we think about mathematics was wrong. Today, my area of research involves explaining how the rules and laws of mathematics taught in schools often lead to contradictions and paradoxes. Elementary mathematics SHOULD be intuitive and built upon a series of common sense insights - yet it isn't. Thirty-five years ago, in 1983, I set myself the goal of changing the way the western world teaches mathematics. Having studied economics at the University of Melbourne, I knew about the folly of making assumptions. No, we can't assume either perfect market information, or that rational decisions are always made. People usually do NOT have all the information required to make a decision and people often make an irrational decision. Unfortunately, mathematics educators have NOT had all the information they require to convey the intuitive beauty inherent in mathematics (that seamlessly connects to the physical world) and neither have they behaved rationally. To teach the same confusing mathematics lessons for centuries and keep expecting different results is NOT rational behaviour. Notably, I failed mathematics at school and even repeated a year because of that fact. Yet, in 1984, a recruitment firm had me tested by psychologists to see if I would be a suitable employee for a management consulting firm. Yes, I got the job, yet I also got a shock! Upon resigning (to become a mathematics tutor), I was given a copy of my psychological appraisal. I had quit my management consulting career to teach children maths in a way that I thought was better than what I had been exposed to at school. Yes, I know that seems absurd, yet the test results in my hand revealed that I was in the top 1 percent of the population for mechanical reasoning and verbal logic! I had long felt stupid because I had once been really bad at mathematics, yet I did very clever analysis with numbers that the partners of the firm I worked at complimented.
" Vedic Mathematics is a book written by the Indian monk Swami Bharati Krishna Tirtha and first published in 1965. It contains a list of mental calculation techniques claimed to be based on the Vedas. The mental calculation system mentioned in the book is also known by the same name or as "Vedic Maths". Its characterization as "Vedic" mathematics has been criticized by academics, who have also opposed its inclusion in the Indian school curriculum. Whilst there are some good mathematical shortcuts to be found in Vedic Mathematics for those interested in high-speed mental calculation, I eventually came to the conclusion (20 years later) that Vedic Mathematics is NOT Indian mathematics. (It is exactly what it is, the mathematics of Swami Bharati Krishna Tirtha.) After looking into the Trachtenberg Speed System of Mathematics, I was able to mentally multiply two 10-digit numbers on a blackboard to arrive at the 20-digit answer (with no visible workings) in a little over two minutes. Yet, my first few years attempting to fix mathematics were really a total waste of time. I was focussed on calculations, not concepts. I had investigated many high-speed calculation books and 'short-cut' books, yet they all required more memorisation and meaning was missing. To be honest, it was only when I began investigating the history of mathematics, that I began to realise where mathematical ideas had been both formed and deformed. Last year I made a bold decision. I would present some of my research, not to school teachers as I had previously been doing, but to a European audience comprised mostly of mathematics education professors and university department heads. My presentation, in effect, was an argument that many if not most mathematical foundations taken for granted by the eminent and expert mathematical audience, were in fact, false! Despite my cheek having dared inform an audience of mathematics education professors that they did NOT understand elementary mathematics, my paper and presentation were gratefully received. Later, in a post-conference email to around 2000 mathematics educators, the organiser of the mathematics education conference* specifically thanked me for my paper and presentation. 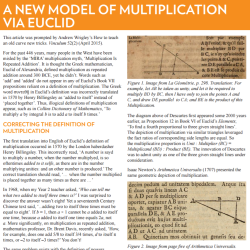 Mathematics educators have the WRONG idea of multiplication. Mathematics educators have the WRONG idea of division. Mathematics educators have the WRONG idea of exponents. Mathematics educators have WRONG ideas of integer inequalities. Mathematics educators have WRONG ideas of negative numbers and Mathematics educators have WRONG ideas about introducing zero. For all the bad ideas in modern mathematics education, it's a tribute to the human spirit that so many went so far in science with such a bad introduction to mathematics. The great tragedy is, that despite India's gift of zero as a number to the world, Indian mathematics education recently ranked second last out of 74 countries. I believe that only by teaching mathematics correctly, via the initial elementary ideas of Brahmagupta that I have spent years refining and extending, will India ever begin to transform into the prosperous powerhouse it deserves to be. Children deserve every chance to succeed in life and the keys of mathematics mastery open more doors than any other. I have only new information and ideas to share. Attendees will not be asked for money at any stage. All I ask is for you to open your mind to the new ideas my research has unlocked, so that you may join me in my quest to improve mathematics education in India. Elementary Mathematics Historian, Melbourne Australia.